The Max-Hand 3000 Durometer is the latest innovation for the testing of specimens with creep. The Max-Hand 3000 has a max-hand and an active hand for observing the creep characteristics of a specimen. What makes the Model 3000 unique is the magnetic-drag maximum reset mechanism. The user simply rotates the reset knob on the front of the gauge to clear the previous reading. The simplicity of the reset mechanism ensures a lifetime of use. Size: 2.25" x 6.125"H & Weight: 11 oz. 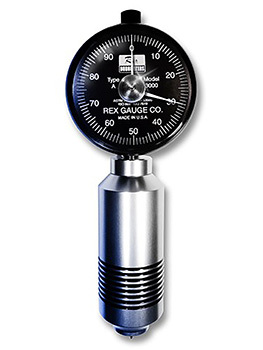 Rex Durometers are known World-Wide for their quality, dependability and accuracy. Except where noted, all gauges comply with ASTM D2240. Most gauges are available in A, B, C, D, E, DO, O, OO, OOO, OOO-S, M, and R. Custom designed hardness/softness gauges and operating stands, along with many accessories are available.